An Australian "jewel": Gouldian finches are also commonly referred to as rainbow finches or simply Goulds. They are among the most brilliantly colored birds in existence. Not sure what to look for? 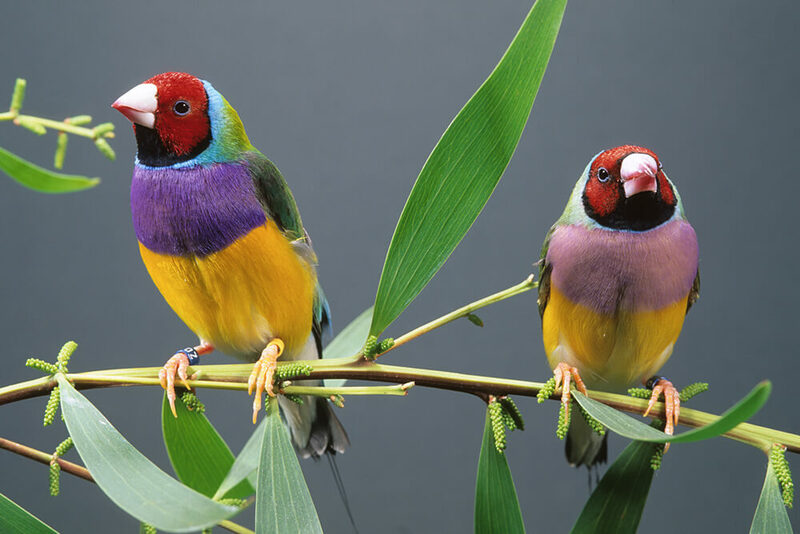 Look for a community of kaleidoscopic colors, and you have found Gouldian finches! The Gouldian finch is an extremely attractive and strikingly colorful bird. There are three distinct color variations in the Gouldian finch, with individuals having either a red, black, or yellow head. All have a wide turquoise band across the back of the head, and the nape and sides of the neck are a light green. The finch's back and wings are a purple-blue. The lower breast, sides of the body, and abdomen are yellow, fading to white. Adult males have bright purple breast feathers, while adult females’ are a dull purple. Juveniles look completely different from the adults: they are a greenish gray. Once they start to grow their adult feathers, it is pretty obvious if they are males or females. Recent estimates suggest that less than 2,500 Gouldian finches remain in the wild. Although once common throughout northern tropical Australia, recent declines now mean that the Gouldian finch is restricted to small and isolated populations in the Northern Territory and Kimberley regions of Western Australia. Gouldian finches are never far from water, preferring open grassy plains with scattered tall smooth-barked Eucalyptus trees. Unlike most other finches, Gouldian finches build loosely constructed grass nests inside tree hollows, and several pairs may share one hollow. Gouldian finches are highly social, sometimes forming flocks of several hundreds in the nonbreeding season. They are nomadic, wandering and traveling within a relatively small area when food or water becomes scarce. Active during the heat of day, Gouldian finches protect themselves from the sun's rays by perching under the vertically hanging foliage of the eucalyptus tree. However, they must be on the alert for snakes, feral cats, and hawks, as all are Gouldian finch predators. The Gouldian finch is a seed eater. During Australia’s dry season, they forage on the ground for fallen grass seeds. During the wet season, an important part of the Gouldian’s diet is the sorghum seed. Here at the San Diego Zoo, the Gouldian finches are fed enriched finch seed and millet, oyster shells, and various greens. Courtship takes place for months before nesting. Males begin the courtship ritual with head bobbing, beak wiping, and feather ruffling to display their brilliant colors. The male holds his body and tail erect, expands his chest, and fluffs the forehead feathers. Talk about putting on a show! The female may respond with some beak wiping. Gouldian finch pairs build open-cup nests in tree hollows or a termite mound. Several pairs may nest in the same tree. The female lays four to eight eggs in a clutch, with one egg laid each day, and both adults incubate the eggs and help to raise the young. Gouldian finches may produce up to two broods in succession, with 4 to 8 eggs per clutch. The chicks may hatch around the same time, often on the same day and perhaps within hours of each other. They hatch without any feathers or down, and with blue, pearlescent (not "fluorescent") papillae, or nodules, at the corners of their beak. These reflect light (as opposed to emitting their own light) and help the parents find the hungry mouths in the dark. The chicks are about 12 days old when the beginnings of feathers start to appear. Juveniles are gray on their head, sides, and neck, and their back, wings, and tail feathers are olive green. Talk about being all the colors of the rainbow! They don’t get their more colorful plumage until they are between eight months and one year old. Generally steady and easygoing, Gouldian finches are not loud or noisy. They usually communicate through a series of trills and soft chirps, hisses, and low-pitched clicking sounds. Gouldian finches have been a part of the San Diego Zoo’s collection off and on since 1940, and live in the Zoo’s Australian Outback habitat, just beyond the Outback’s entry totem poles. Most of these birds were donated to the Zoo by the Finch Society of San Diego. The Gouldian finch is classified as near threatened by the International Union for the Conservation of Nature. Fires are listed as the primary threat to the Gouldian finch. Due to their beautiful colors, the finches are among the most popular pet birds. Gouldian finches are also threatened by habitat modification due to cattle grazing, wildfires, and increasing human developments. The Gouldian finches depend on grasses and seeds, specifically sorghum seeds, and the disruption of the natural growth of these grasses makes it difficult for the species to survive. Two recovery plans have been developed and implemented for this species, and a national recovery plan has recently been adopted. Only the male Gouldian finch sings. The Gouldian finch is also known as the Lady Gould’s finch, named for the wife of John Gould, a famous 19th century British ornithologist and artist. Gouldian finches prefer temperatures constantly above 80 degrees Fahrenheit (27 degrees Celsius). In the 1992 movie Batman Returns, the bird that Catwoman puts in her mouth is a Gouldian finch.